The publisher says… Gerald is careful. Piggie is not. Piggie cannot help smiling. Gerald can. Gerald worries so that Piggie does not have to. Gerald and Piggie are best friends. In I Really Like Slop!, Piggie invites Gerald to try her favorite food . . . slop. But Gerald is not so sure he’s going to like it. At all. 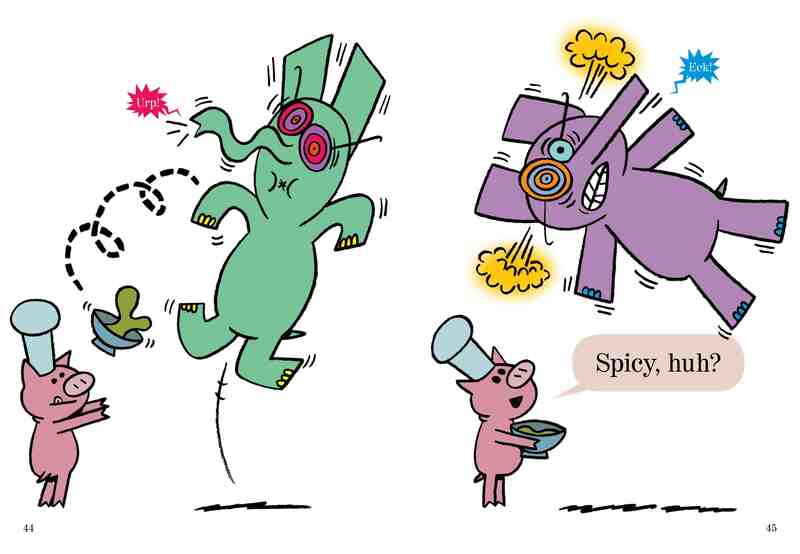 Eva says… So who DOESN’T like Elephant and Piggie? But THAT’S not the question here. The QUESTION is, who likes SLOP? And the ANSWER is, Piggie likes it but Elephant WILL NOT try it, and who can blame him? When Piggie eats it, it looks like it’s some kind of drug or something, because it makes her go all jumpy and turn different colors and all that. But what it is is that it’s just really GROSS! But Piggie likes it and so you don’t HAVE to like it. And neither does Elephant. And that’s GOOD news. This is a real good one like all of their books.